After Halloween, people tend to forget about bats. But, for farmers, residents of Kenya, and scientists, bats are a part of everyday life. 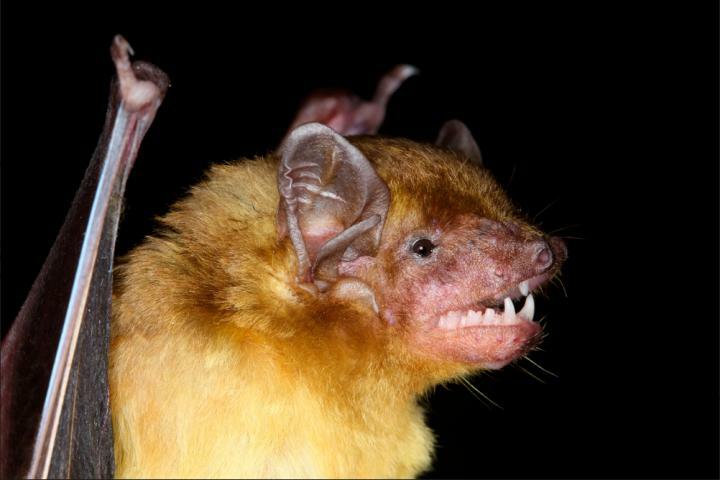 While North America has 44 species, Kenya, a country the size of Texas, has 110 bat species. Many of these species also contain subspecies and further divisions that can make the bat family tree look like a tangled mess. Researchers set out to cut the clutter by sorting the lineages of yellow house bats and in the process found two new species. The bats of Scotophilus vary in size and other characteristics but, in general, "They're cute. They look a lot like the bats you see in Chicago but they're this great yellow color," says Terry Demos, a Postdoctoral Fellow at Chicago's Field Museum and lead author of a recent paper in the journal Frontiers in Ecology and Evolution. These furry creatures can roost in the nooks and crannies of homes in Kenya. "These are bats that live with people–they don't call them house bats for nothing," adds Bruce Patterson, MacArthur Curator of Mammals at the Field Museum and co-author of the study. Bats usually don't fly too far to find a home either. Despite having wings, bats prefer to stay in a specific region, resulting in huge amounts of diversity throughout Africa. Before understanding how these bat species related to one another, it was difficult to even research them. "We were using three different names for these bats in the field," says Patterson. That kind of evolutionary confusion is enough to make anyone batty. As Demos and Patterson explain, bats that look very similar could have wildly different genetic information. This means that new species could be hiding in plain sight due to their physical similarities to other species. The only way to solve this mystery is to use cutting-edge genetic analysis techniques. Skin samples collected from the field in Kenya, combined with information from an online genetic database, provided clarity to species confusion. Comparing all the DNA sequences of the samples showed the amount of similarity. The more similar the DNA, the closer species are to each other evolutionarily. This information was then used to make a chart that looks like a tree, with branches coming off one point. The tree is similar to a family tree, but instead of showing the relationships between different family members, it shows the relationships between species. The results accomplished the goal of finding the limits of species but also showed unexpected results. Besides sorting the known species, the tree predicted at least two new bat species. "These new species are unknown to science," says Demos. "There was no reason to expect that we'd find two new species there." When Patterson saw these two undescribed species, he got excited: "It's cool because it says there's a chapter of evolution that no one's stumbled across before." These findings are not only interesting to scientists but to the local farming industry. Organic groceries at Trader Joe's would be next to impossible without bats. They act as a natural pesticide, eating insects that threaten crops. Besides farmers, local health officials also rely on bat research because bats can be disease vectors that threaten public health. Being able to understand bats means that scientists can protect public health and plates of food. This unexpected finding attests to the diversity of life in Kenya and other tropical locales in Africa. The variety of species in these regions is not ye described because, "Africa is understudied, and its biodiversity is underestimated, and it's critical because there are threats to its biodiversity," says Demos. This research gives a framework for future scientists to categorize species of bats and describe new species. In the United States, because our bats are well researched, there is an app that can recognize bat calls, kind of like Shazam for bats. Patterson plays bat sounds off his phone,"I recorded this in my driveway and an app was able to identify the bat. This is what we want to be able to do in the field someday." The next step in this research is using the genetic analysis of Scotophilus bats as a framework that allows scientists to categorize and eventually recognize species based on observable features, such as the chirps, squeaks, and sounds human ears can't hear. Demos notes that it is important to better understand these mysterious flying mammals to help conservation and local farming efforts. This study surveying Kenya paves the way for exploring other regions using the same methods. Science has brought us closer to understanding how bat species relate to one another, but Patterson says there is still more to discover–"No interesting biological questions are ever fully answered, and progress towards answering them invariably opens up a variety of others."